Mortgage Bankers Association head David Stevens summarizes MBA’s views on GSE reform. In particular, he addresses MBA concern with the idea that the mortgage market could best be served by a system that entails revising the current charter of Ginnie Mae and allowing a new Ginnie Mae to apply its guarantee to private sector mortgages. On December 14, the Harvard Joint Center for Housing Studies (JCHS) released its biennial review of the nation’s rental housing. This report is a companion to JCHS’ annual State of the Nation’s Housing report. Following is a link to the report’s executive summary. Potential ‘Turning Point’ for Rental Housing? A summary of the key findings of the Harvard Joint Center for Housing Studies' (JCHS) biennial review of the nation’s rental housing. A change in the technology utilized by the Internal Revenue Service has created a glitch in a system used by home lenders that could end up delaying mortgage closings by months. The Yves system is used by the mortgage industry to verify that tax returns supplied by an applicant for a residential loan are not fraudulent. A vast majority of the 6 million mortgages processed each year depend on the system due to investor and regulatory requirements. How Much is Your Home’s Collateral Value? Recently, Fannie Mae and Freddie Mac announced plans to waive the requirement of a professional appraisal on qualified purchase loans with a loan-to-value ratio at or below 80 percent. This brief article summarizes CoreLogic’s analysis of the differential values obtained through appraisals and alternative valuation methods, and their impact on underwriting loan-to-value ratios. The cost of mortgage servicing, at least those collateralized into bonds, keeps rising — a trend Fitch Ratings believes is not likely to end. This article briefly summarizes four factors driving costs higher, with the number one being compliance. Out-migration, especially of Millennials, has impacted Virginia’s growth, economic environment and housing costs. UVA’s Weldon Cooper Center provides updated data on this trend and discusses its causes and implications. For the first time, Virginia is experiencing new out-migration on a statewide basis, and is beginning to display the demographic trends already in place in the states to our north. In addition to the 2018 Housing Credit Workshops, VHDA will offer four upcoming classes. Please join us for the EarthCraft Building Professional Training, How to Complete an LIHTC Application, Universal Design Seminar and Architect Certification, and Universal Design Plans Submission Requirements. This 7-hour builder training provides a comprehensive overview of best practices for sustainable construction and design and explores how the EarthCraft program can help you get started in the green building sector. Whether you’re a single-family home builder, developer, architect, HVAC or insulation contractor, property owner/manager, or Housing Development Authority, you’ll learn cost-effective ways to improve the energy efficiency, indoor air quality, comfort and durability of homes, and enhancing overall client appeal. Take advantage of this opportunity to learn about the benefits of EarthCraft certification, learn more about the program, and get valuable information on effectively marketing the advantages of EarthCraft certification to their prospective buyers. Open to all who wish to attend. This class is worth 6 self-reported continuing education credits with the AIA. VHDA wants your deal to get all the points it deserves! There will be a new application format for 2018, so don’t miss these updates! This class, presented by VHDA's Housing Credit department, provides vital information for new and experienced developers, as well as any staff members involved in Virginia’s Housing Credit program. We’ll provide page-by-page instruction on the mandatory items and reservation, allocation and 8609 application, which are required for applying for Low-Income Housing Tax Credits (also known as Housing Credits). You’ll learn tips and tricks to avoid penalty points for common errors such as insufficient documentation, minor mistakes or misunderstood questions. You’ll also have an opportunity to ask questions and receive answers straight from the staff that will be reviewing your application. 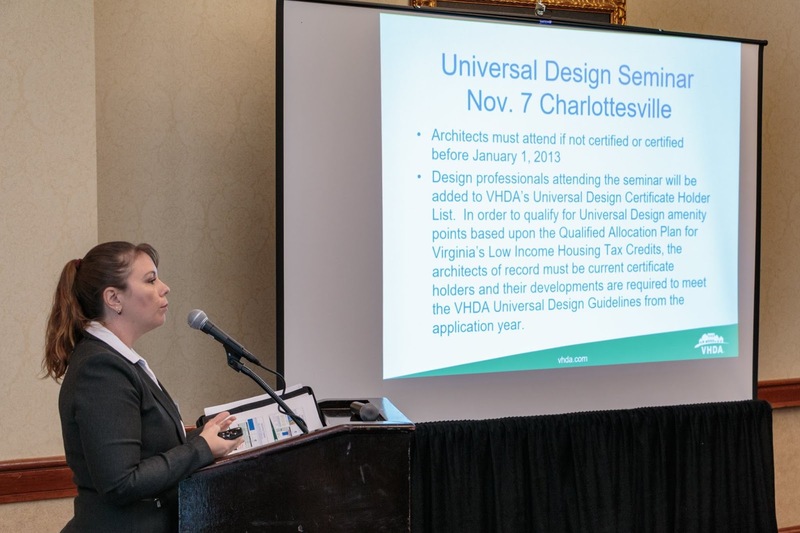 Certificate holders who completed VHDA's Universal Design Seminar prior to Jan. 1, 2013, must re-attend in order to be eligible for Universal Design points in the 2018 Tax Credit Application. This new class, presented by VHDA's Housing Credit department, will cover every item required on the Architect Certification and the required elements needed in the Universal Design plans. We’ll provide a question-by-question explanation of the architect certification as well as the format you must use to present your plans, including examples. This class should be attended by owners and architects who plan to submit an LIHTC reservation application, because the better you understand the requirements, the less likely you are to receive penalty points for incorrect information or errors in your submission. For 25 years, project:HOMES has touched the lives of nearly 13,000 low-income, disabled or elderly homeowners in Central Virginia. They've made it possible for many people to remain comfortably in their homes as they age, by providing more than 20,000 repairs and renovations. They install insulation, LED lighting and air conditioner window units, and they repair or replace plumbing, electrical systems, floors, roofs, porches, steps and railings. Volunteer crews do exterior painting and yard work, and install wheelchair ramps, grab bars and more to improve accessibility. VHDA has a longstanding relationship with project:HOMES, and we're honored to support their important work with grants funded by our REACH Virginia program. Each year, VHDA contributes a large portion of our net revenues into REACH Virginia to support the work of nonprofits that share our housing mission. The grants to project:HOMES help them strengthen their infrastructure, extend their reach more effectively, and revitalize neighborhoods by preserving existing homes and building quality, affordable new homes. VHDA's Capacity Building grant enabled project:HOMES to provide management training for staff to help them enhance their performance management system. It also made possible a study by VCU, analyzing demand for their services by age and income, pinpointing areas of greatest need and gauging the impact they were having in those communities. The grant also provided for a consultant to conduct a study and develop strategies to improve their fundraising. Project:Homes also received an AmeriCorps Vista grant. They were able to obtain a highly skilled Vista worker for a year, at no cost to them, who is helping them enhance their use of social media, video, photos and stories for marketing and fundraising. VHDA also provides low-interest financing to help project:HOMES complete large-scale projects. One example is The William Byrd, a 1925 hotel on the National Register of Historic Places. They first converted it to apartments in 1996, and then more recently into 104 homes for low-income seniors. Lee Householder, CEO of project:HOMES, summed up the partnership with VHDA like this: "In many ways, VHDA recognizes the challenges we face in sustaining ourselves as a nonprofit, and they provide the resources and expertise to help us overcome them." 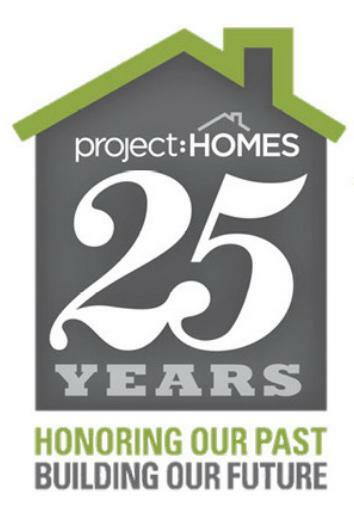 Congratulations to project:HOMES on their 25th anniversary!